The idea that just about anyone with access to a 3D printer could theoretically spit out a gun with a few clicks is certainly disconcerting, but up until now, the person firing the damn thing was putting themselves in just as much danger as the person on the other end. A new type of ammo, though, is promising to make these plastic firearms fare more reliable—and consequently, way more dangerous. Unlike those in Defense Distributed's original 3D-printed gun, the new bullets, which were designed by 25-year-old machinist Michael Crumling, actually take the brunt of the force that comes with firing a shot. So instead of the decidedly less-sturdy plastic barrel having to contain the explosion, a lead bullet sitting a whole inch inside a much thicker steel shell manages to absorb the majority of the force. And whereas the more menacing metal 3D-printed guns require skill and funds enough to keep it out of the hands of the everyman (at least for now), Crumling's firearm was printed on a consumer-grade $400 Printbot. Thankfully, though, this more effective ammo has to be individually machined with each round taking about an hour to make, meaning that the majority of people aren't going to have the tools necessary to replicate Crumling's designs (which he's offered on his site for free). That's the main reason I developed these, and that's the next step. 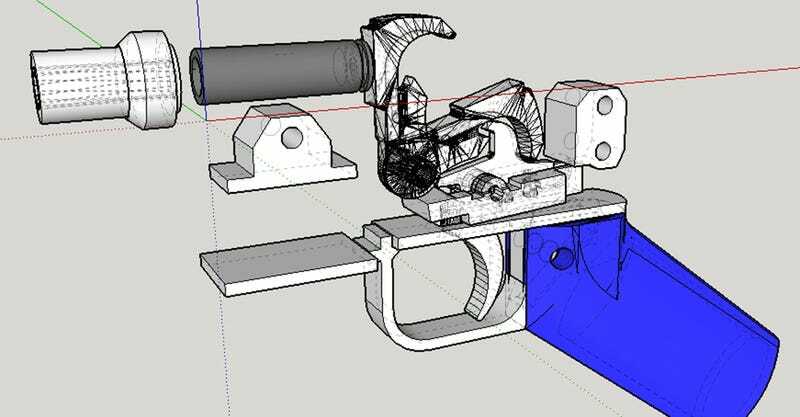 This is a building block for the future of 3-D printed firearms that will enable people to develop semiautomatic and—if you had the proper legal paperwork—even fully automatic weapons.